A Newtownabbey teenager whose father and grandfather died prematurely from heart problems is in hospital in England waiting for a heart transplant after being diagnosed with a serious illness just weeks ago. Paddy Flynn from Longlands was rushed to the Freeman’s Hospital in Newcastle Upon Tyne in August and is waiting for a heart to become available for a transplant. Paddy, who is the son of well known republican Seamus Flynn who died of a heart attack during a republican commemoration parade in Greencastle in 2007, only discovered he was ill two months ago when he was unable to keep down food. 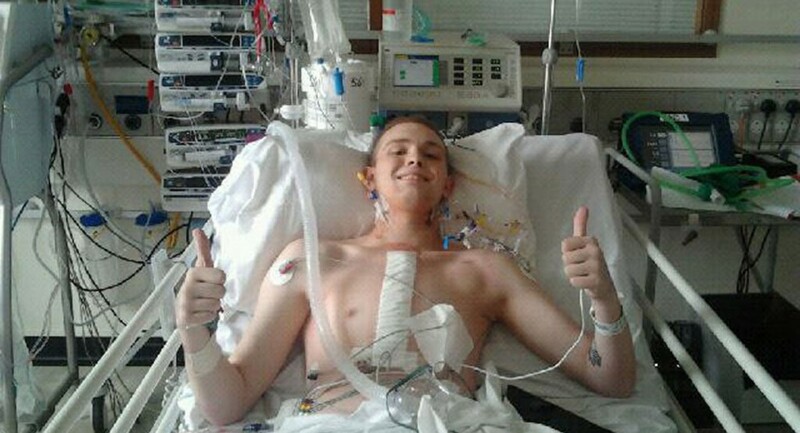 The 19 year old was diagnosed with cardiomyopathy and was fitted with a pacemaker. However after his condition worsened two weeks ago he went to the City Hospital where he was told he needs a transplant. Paddy was airlifted to the English hospital where his mum Josie, girlfriend and aunt are keeping vigil by his bedside. He recently underwent surgery to have a pump inserted into his chest to help ease condition his until a heart becomes available. Paddy’s dad Seamus collapsed and died of a heart attack during a republican commemoration parade in Greencastle in 2007. The 43 year old was a founder member of the Greencastle Martyrs Sinn Féin cumann and suddenly fell ill while carrying a commemorative wreath during the parade. Paddy’s uncle Kieran Flynn said heart problems run in their family. His father dropped dead at 39 with a massive heart attack, his brother Seamus passed away and he himself suffers from heart problems along with another brother. He added that his whole family and friends back in Belfast were praying for Paddy’s recovery. “His mummy, aunt and girlfriend are with him and they are keeping him in good spirits,” said Kieran. Kieran also stressed the importance for new organ donors to help people in a similar position to Paddy’s saying the family were encouraging people to sign up to the organ donor register. “I would ask anyone who isn’t already signed up to do it. We re just waiting now on news for Paddy, signing up to this could save someone’s life,” he said.